Anchalee Saengtai is a Thai woman who started a small business a couple of years ago in her garage. She made science-fiction sculptures from scrap metal – mainly inspired by movies like Aliens, Predator, Transformers, Star Wars, Spiderman and so on. 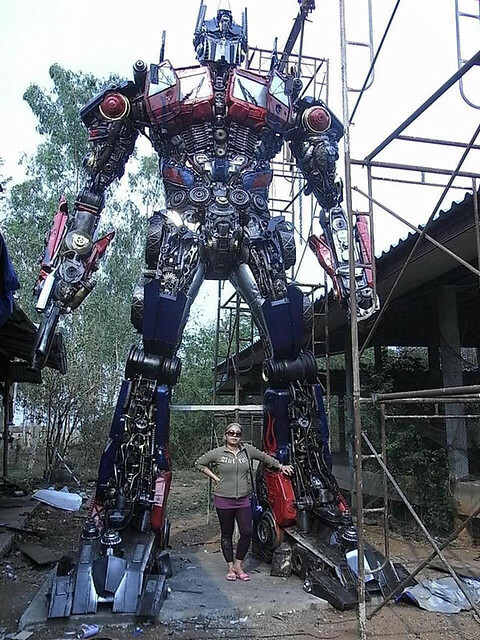 Now, she has created six meter high Transformer statues from old car parts. One of the things about Thailand is: you will find many people who follow some kind of weird or quirky interest. Thai people are generally quiet open to different kinds of expression and styles, so it can be interesting to see.